A Long time ago, before the white men came to America, the Zuni people, then known as A'shiwi, experienced a terrible drought. Their crops were ruined and the tribe was forced to abandon their village of Ha'wi-k'uh and accept charity from the neighboring Hopis. This compelling myth tells of the lessons the Zunis learned from that experience. When they abandoned their village, the Zunis left behind a boy and his sister. 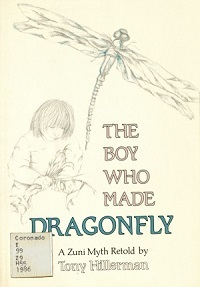 The little girl was lonely and afraid, so the boy made a dragonfly to amuse her. The dragonfly came to life and asked the Council of the Gods to bless the children. And the boy and his sister were made wise so they could become leaders of their people (Hillerman 1972: Promotional copy from the back cover).